There is an additional package intended for screen readers that excludes the visual plugins. 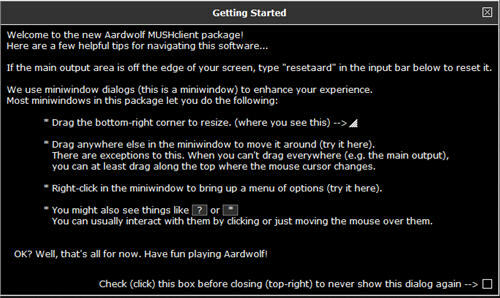 To play a screen-reader friendly version use the Aardwolf Non-Visual Installer. If you would prefer to download a zip file version that you can unzip to any location including a portable thumb drive, use the link below instead. Note that when running a manually unzipped version you will have to take some manual steps to upgrade to future releases without losing settings. Check the documentation on the download page for more details. When you first load the client, the window below will appear giving you information on how to move and resize the windows. Study these directions carefully then enjoy playing Aardwolf, that's it! You can also Visit the Aardwolf Client Plugin Page for information on the options available within each window. If you need general help with how to use Mushclient to play Aardwolf and your question is not addressed on the client FAQ page, the best place to ask is in the game itself on either the 'newbie' or the 'tech' channels. If nobody is around to answer your question, there is also a 'tech' board in game. There is also a more detailed FAQ and documentation wiki available oN THE Client Github page. If you have problems with the Mushclient configuration and/or have a bug to report in the client itself, you can visit the official project page (maintained by Fiendish) and report bugs and/or feature requests at https://github.com/fiendish/aardwolfclientpackage/issues. Bug reports in the actual game should still be reported to the 'bugs' board within Aardwolf. As you get more into the game you may want to explore some more advanced features of Mushclient such as making your own triggers and aliases. The Mushclient Forum is a great place to learn more about the client itself and has an active community ready to help with any problems. Windows 7 and some version of Windows Vista do not include the program necessary to view the .hlp files used by Mushclient. Players using those systems who are unable to access the Mushclient built in help will have to download the correct version of the WinHlp32.exe program from the Microsoft Support Site. With newer releases of the client, updates should be as simple as running the new installer but you can always make a copy of your mushclient directory for extra safety if you like. When using the zip file version you will need to carry out the previous manual upgrade steps - these are now detailed on the Zip Package Download Page. If you would like to beta-test new client releases ahead of release, the very latest version can be obtained from the Github repository at https://github.com/fiendish/aardwolfclientpackage/archive/MUSHclient.zip. The current version on aardwolf.com is r1944 - if the current version in the Github repository is the same then there is nothing new to download. A full history of major revisions and changes can be seen on the Aardwolf MUD Client Installer and Change Log page.